With the 2018 WJCs less than a week away, teams are finalizing their rosters. Jake Oettinger, Patrick Harper and Brady Tkachuk are on the roster for Team USA, which plays an exhibition game tonight against Belarus. Kasper Kotkansalo (photo) is on Finland’s roster. Dante Fabbro is inactive for Canada due to a lower-body injury. One more Terrier will be playing international hockey during the semester break. 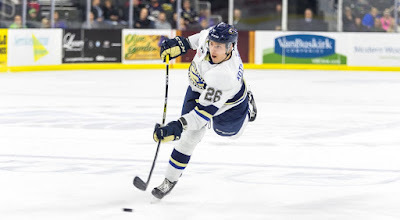 Captain Brandon Hickey has been named to Team Canada’s roster for the Spengler Cup Tournament in Davos, Switzerland beginning next Monday. 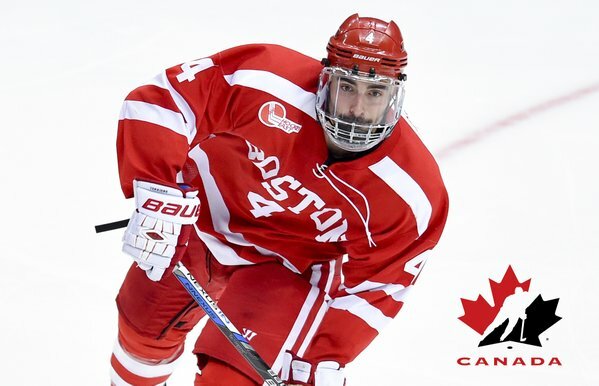 Hickey is one of four current college players suiting up for Canada. Two seasons ago, the defenseman from Leduc, Alberta represented Canada in the World Junior Championships. Dylan Sikura (Northeastern), Jeremy Davies (Northeastern), Brandon Hickey (BU) and Jake Evans (Notre Dame) are the current NCAA players named to Team Canada's Spengler Cup team. 2018 recruit Jack DeBoer scored his fourth goal of the season and fellow recruit Tyler Weiss contributed an assist in the NTDP U18s’ 6-3 loss to Muskegon. Charlie McAvoy produced a Gordie Howe hat trick—a goal, an assist and a fight—in the Bruins 7-2 win against Columbus on Monday. And, to add an exclamation mark, his 5th goal of the season was the game-winner. In case you missed it—the Boston Globe’s Fluto Shinzawa, a former Daily Free Press writer, had a pair of articles in Sunday’s paper about Jack Parker and Matt Grzelcyk (photo). 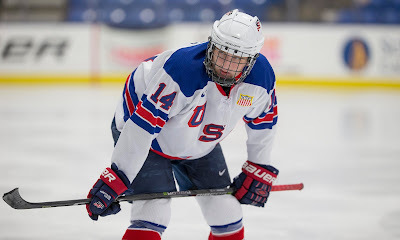 The former looks at recent U.S. Hockey Hall of Fame inductee Parker’s impact on changes in college hockey, including the challenge of a new “landscape where players are already considering their exits as soon as they’ve put down their bags for their first college lectures. 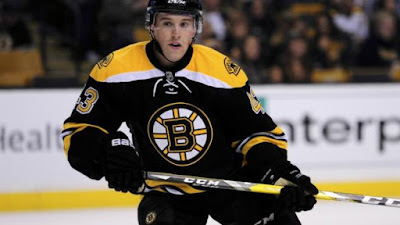 The latter makes a strong case for the former BU All-American, who is averaging nearly 15 minutes a game and sees time on the power play, to remain on the Bruins' blueline rather than be returned to Providence. Former BU goalie Sean Maguire has been traded to Arizona as part of a multiplayer deal involving the Penguins and Coyotes. Maguire has spent most of the season with ECHL Wheeling (8-3-0, .910 save percentage, 3.28 GAA) and played four games with AHL Wilkes Barre/Scranton. David Warsofsky’s shootout goal was the difference as San Antonio edged Rockford, 2-1.